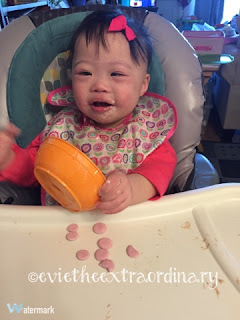 The greatest guessing game of all is...how to motivate Evie to eat. Someone was surprised that we actually count the number of BITES (and not ounces) that Evie takes. Well, that's because that's all she'll eat by mouth. We are averaging 5-8 bites a day, although every once in awhile she'll eat more than 20 bites for our nanny, who is definitely our MVP. The end goal is to cut down on her g-tube feeds so that she'll be hungrier. When we get clearance for having gained back all the weight she lost this winter, we will start the adventure! 1. A child with oral aversions or sensitivities can be very sensitive to where the food falls on her tongue. When we feed her with a spoon, she does fine with food on the tip of her tongue. But any food towards the middle of her tongue makes her gag. 2. For some reason, when she gags, if we blow gently on her face, she stops gagging and smiles. It's like magic. Wiping her mouth helps too, but we try not to do that every time because we want her to get used to the sensory feeling of food on her face. 4. 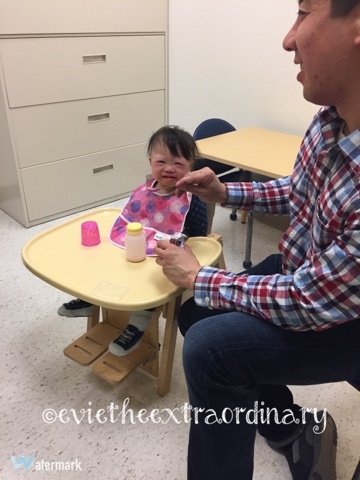 They say spicy and salty foods can be motivating for a child, but Evie just makes a funny face and turns her head away. She still prefer sweet food. 5. When Evie turns her head away and grunts to say "no," we have to honor her "no" and avoid continuing to offer her food. If we don't respect her "no," the food aversion gets worse. We keep telling ourselves it's the quality of the eating, and not the quantity. 6. I have stopped buying gadgets or fancy cups. I don't think they work (10 different cups later). That's just my experience with Evie, but it seems like the things that have worked best are clear medicine cups for drinking (smaller volume, less waiting time to get to the mouth, able to see when the liquid is close to the mouth), low profile spoons (we use the ones below or the Munchkin infant spoons), and modeling drinking and eating for Evie. Evie likes to drink from adult glasses when she sees us drinking from them. She prefers fine china instead of cheap plastic cups. That's my Princess Evie! 7. We were told to put rolled up towels under Evie's arms in the high chair to stabilize her. Apparently she won't bring her arms up to play with food because she's working so hard just to sit up in her chair. Who knew it was so much work to bring her hands up to the tray? This mommy didn't! So what is Evie doing lately and saying yes to? Besides eating Mommy's cell phone and licking her iPad, she is still ok with Level 2 purees (mostly fruits), Siggi's 4% milk fat wild berry yogurt, and tastes of my Boloco Soy Berry smoothie. She LOVES applesauce and the other flavors of the Gerber's First Tastes snacks. What kind of help do we get for Evie's feeding? We have a weekly visit from an Early Intervention speech-language pathologist (SLP) who knows a lot about feeding. We also see a SLP every few months at Boston Childrens, and then see another SLP when we have a morning at the Down Syndrome Clinic at Boston Childrens. With all those visits, I wish it meant that we made tons of progress, but really it's up to Evie and how much she wants to eat. My hope is that soon we will be given medical clearance to cut back on her g-tube feeds and start making her more hungry so that she will be more interested in eating higher volumes. Evie is finally back at her weight that she was in November, before the horrible winter flu/RSV/norovirus season that hit us! We hope everyone is enjoying spring as much as we are! Lots of pics of Evie enjoying springtime to come!